How does a reporter fight a case of insomnia? By doing some research to write another blog post! In my efforts to unearth the resurgence of popularity for Jason McElwain five years after his memorable 20-point game that propelled him to permanent celebrity status among the autism community (a 2006 CBS Evening News feature was recently shared among Facebook users), I found a story published last week by Craig Fox of the Watertown Daily Times. The 22-year-old McElwain can add public speaking to his credits, as Fox documented his speech to a crowd of 100 at the Jefferson Rehabilitation House’s annual dinner in upstate New York. Fox recaps McElwain’s life-changing game that recently gained a second coming on Facebook with its users sharing the story once more, but notes a few details from McElwain’s speech the audience may not have known when he first was a media sensation. McElwain attended a special education school at a young age and didn’t understand why until years of inquiry led to his mother telling him about his autism diagnosis. He tried out for Greece Athena High School’s junior varsity team, but didn’t make the cut. His “failure” led to his position as team manager, running drills in practice and doing whatever was asked of him. Fox also reveals where McElwain picked up his “J-Mac” nickname, given to him by Athena varsity coach Jim Johnson because he had a difficult time pronouncing Jason’s last name. Johnson had no difficulties rewarding his loyal manager, letting him suit up for the final regular season game, where McElwain nailed six three-pointers and a deuce to finish as the game’s high scorer. McElwain told his audience he achieved his dream while shooting hoops in the driveway of making the game’s last shot. However, he considers Athena’s Section 5 title that year to be a bigger moment for that roster. Fitting with his passion for sports, his favorite moment in the aftermath wasn’t meeting President George W. Bush, Oprah Winfrey, or writing his autobiography. McElwain is most proud of earning a 2006 ESPY Award for Best Sports Moment of the Year and working as an equipment manager for the NFL’s Indianapolis Colts, which included a meeting with quarterback Peyton Manning. Fox illuminates how time can benefit journalists when the concept itself appears ironic with a schedule filled by story deadlines. Once McElwain’s life-changing game video surfaced, every news outlet in any form that covered the story focused almost exclusively on the game. ESPN was first to provide a back-story, producing a feature that ran in the 2006 NBA Finals about how McElwain inspired the country, including a young autistic boy who also took up an interest in basketball (his father played for Richmond and orchestrated an upset of Syracuse in the first round of the NCAA tournament). More stories would surface occasionally following up on the man who stood 5’6″ his senior year and hit 6’0″ before he finished growing, each detailing a new note to readers caught up in the hoopla of McElwain’s public appearances and meetings in the weeks and months following his 20-point game. While the details don’t provide an insight that would drastically change the story, Fox does reveal just how deep McElwain’s passion for sports. Fox also enlightens us on Jason’s exploits as everyone’s favorite autistic basketball players continues his mission to be “just one of the guys.” As I noted in my last post, the shift from solely dwelling on autism’s deficits to embracing its advantages will play a key role in the future direction of the autism population. McElwain benefits from this not because he can remember what you ate for breakfast on a specific day five years ago, but because his biggest interest is an area shared by many people in many backgrounds. In fact, I have yet to read a story that summarizes just what exactly McElwain’s specific deficits are, making it clear that acts of greatness can transcend a status quo. Of course, his passion for sports is an assist, because sports itself is considered the great unification among communities. No polarizing politics, no debates about morality or the economy, just a bunch of people relishing in the talent of their athletic idols. Fox won’t be the last reporter to tell McElwain’s story, and every time we see Jason appear, look for another of his endeavors to appear that will reinforce the notion autism shares a similarity with other disabilities: they’re merely obstacles to be cleared. Holly Robinson Peete calls herself an autism supermommy on her Twitter account, and following this month’s insight on autism on The Talk, a CBS show she co-hosts, her followers may envision her with a cape. Peete hosted autism awareness segments for four weeks on Fridays, bringing the audience up to speed on the disability while sharing the stories of her own endeavors and the journeys of others. 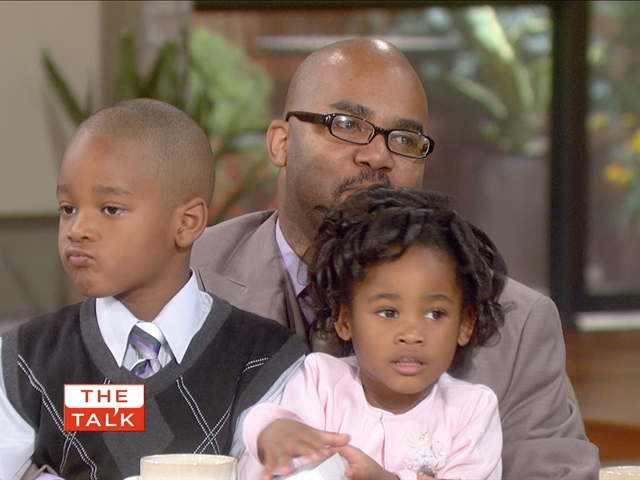 You won’t see Peete’s autistic son, RJ, distract her from her hosting duties on The Talk. Based on the segments aired in the month of April, the only interruptions were joyful expressions as she sought to debunk the stereotype of autistic people casting a societal burden. 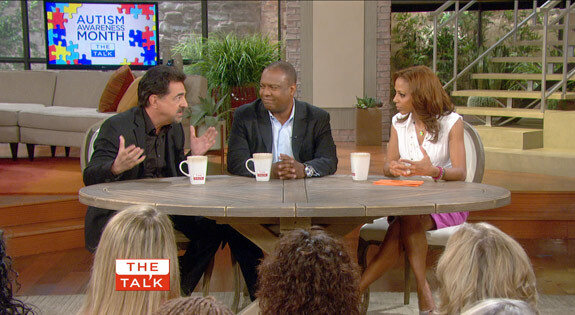 You can watch all of Peete’s autism awareness segments on YouTube or The Talk’s own website. Her clips aren’t placed in a subcategory, but that won’t stop me from critiquing Peete’s voyage into mystery. Week 1 was clearly targeted for any “cave dwellers” left who never heard of autism or understood its meaning. Since Holly carries a personal connection, the series began with a two-part package on RJ and the implication his diagnosis had for Holly and her husband, former NFL quarterback Rodney. The package was designed to carry an emotional weight, supplemented by stock music that would change in tone along with the story. Holly’s celebrity status brought no change in outlook with her son following his 2000 diagnosis, with the pediatrician on hand defining RJ’s autism as a roadblock from expected milestone’s in a child’s lifetime. A chat among the hosts followed, where Holly reveals that putting her son on a wheat and dairy-free diet helped his condition (I’ll touch on this later). She then updates the audience on RJ’s condition, where he recites an award speech, and mentions the HollyRod Foundation started by her and her husband. Holly brought her friend and Autism Speaks member Peter Bell to provide an oversight on autism, its symptoms and the world of confusion a diagnosis often forces its inhabitants to guide through. Bell then promoted Autism Speaks’ “Light it Blue” campaign (a play off their blue puzzle piece logo, itself a nod to the multi-colored puzzle pieces that represent autism). Week 2 shifted the spotlight from Holly to her husband, and by extension, fathers of autistic children. Often the “forgotten” parents in the conquest to understand the spectrum (magnified by the amount of attention to mothers in the very medium Holly used to promote autism awareness), Holly brought her husband and Criminal Minds star Joe Mantegna to the set as visual reminders. Rodney shared his transition from denial to advocacy with RJ and the strain his conversion length had on his marriage. Mantegna, father of a now 23-year-old autistic daughter, guided viewers through his search to find a school in Chicago that could adapt with an autistic first-grader in a social environment that didn’t foster openness on differences. Jimme Smith provided the non-celebrity viewpoint, which wasn’t all that different from his more recognizable peers, except he’s divorced and raising both his kids as a single father. Holly awarded Smith an iPad 2, known for helping autistic people communicate more easily, and a vacation to Disney World in recognition of his effort to raise his kids. Week 3’s focus was teens who defied the common stereotypes of young autistic people. Holly invited Carly Fleischmann, a non-verbal Canadian who uses a computer and voice recognition software to communicate with vocal linguists. While Fleischmann made a live appearance at the set, her interview was pre-taped and edited for time because she can’t control her symptoms as easily as other spectrum members. Fleischmann notes the lack of control and inability to speak as primary factors for harsh judgments, but that hasn’t deterred her fan base of over 12,000 Twitter followers. Winfred Cooper, a verbal autistic, also appeared on the show for his 67-yard touchdown catch on his high school football team. Winfred’s path to higher education after graduating with honors inspired his father to get his teaching degree while serving as Winfred’s college aid. Week 4 brought back a familiar face: Jason McElwain, who I ironically noted was fading from public attention five years after his 20-point game as a high school senior won the admiration of the country. His interview was taped in advance and edited rather short (with my TV experience, I can spot clear edits as broadcast shows make room for their commercial time), but there was just enough space for him to tell the audience he coaches at Greece Athena High School and the 17U East Coast Fusion AAU team, which he hopes will parlay to a varsity high school or college coaching position. Peter Bell returns to bookend the series, offering tips on helping autistic people adapt with mainstream society. Overall, the editors who squeeze The Talk‘s raw footage to 38 minutes per broadcast almost served as documentary producers, fishing for what was considered the best material to air on a show still aiming to stand out in the talk show genre. Granted, virtually any topic could be procured beyond the time allotted, but with autism’s complex structure, there’s a plausible argument on the first chapter of the autism awareness series not maximizing its usefulness inside a short time frame. Even in more in-depth profiles, few glimpses were publicized. Mantegna’s story was brief, where only his story on finding a supportive school for his daughter was aired. Winfred Cooper’s package detailed his achievements up to his interview, but we didn’t hear his own thoughts on college and his ascension plans after higher education. McElwain’s mini-window was the biggest surprise since he was autism’s biggest celebrity a few years ago. With no additional material available, ascertaining sound bites edited out of the original broadcast is impossible outside of the show’s production staff. Perhaps nothing of value was said, or new avenues were left unexplored. Unfortunately, such thoughts will remain only a curiosity. Viewers who watched all four installments may have noticed an element to autism often overlooked by most mainstream press coverage, and that piece of the puzzle starts with Holly. No one featured on the autism awareness segments dramatized this, but Holly’s African-American heritage within her family should serve a sign to other families and reporters about autism’s lack of discrimination. Beyond Holly and Rodney, two African-American families were featured in her exploration. Virtually every mainstream story I have read or watched profiling families living with autism featured Caucasians. Their struggles aren’t lower in difficulty, but autism can manifest in anyone of any lineage. Autism and race are rarely intertwined in public, and I doubt they will as the mixture would overshadow efforts to promote awareness in both categories, but journalists should note that everyone can suffer from the mystifying disability. Holly’s bucking of mainstream media also extends to a point I’ve repeatedly underlined: fathers. Yes, the divorce rate among parents with autistic children is high (although I have yet to see a number to validate those claims), but as Holly and Rodney prove, stats aren’t necessarily linear with the unpredictability of human emotion and negotiation. Although Rodney battled to ignore RJ’s autism diagnosis, his transformation morphed his battle strategy to advocating autism awareness. Mantegna illustrated his involvement with his emotional reaction when he found a teacher who would get her class to help and support his autistic daughter, and Smith had nothing but respect for single mothers raising autistic children as his single status created an empathy bond. Returning to the point of Holly putting RJ on a diet, the New York Times Magazine article I discussed covered the newest craze among autism parents, who claim removing wheat and dairy help alleviate autism symptoms despite no scientific research to support those claims. Her internal strategy influenced the actions she pursued to help RJ, as supportive mothers are more likely to follow instinct no matter how much or little scientific backing there is for a treatment. By no means are they fools, they are simply less apt to strictly follow logic when facing a disability boggling the minds of non-autistic people. Holly doesn’t ignore logic though, as she chose to highlight strong minds in the final two weeks of her autism awareness coverage. There will never be a shortage of role models for anyone in anything, but only recently has mainstream coverage on autism followed suit. While McElwain was a big get whose appearance will refresh memory banks, Holly and The Talk imported other success stories beyond usual idols. In that respect, finding new sources to speak on autism may reflect on the work she invests in the HollyRod Foundation. Whether this inspires fellow stations to find new success stories is uncertain, but interviews with Fleischmann and Cooper stress the point a psychologist made in my first documentary on autism that reporters can absorb: anyone afflicted with any disability always has a potential to improve their condition and offer a productive role in societal communication. Assessing long-term impact from The Talk‘s journey through autism will require time to procure. There’s no telling if we’ll see this feature return next April as that will first depend on CBS’ stance on continuing the show to the 2011-12 season and Holly’s interest in holding her co-host role. What can be said is her contributions for the autism community may benefit reporters assigned to future autism stories, as her segments will either lead reporters to borrow the sources she used or inspire them to reach untouched depths. Either way, Holly could not only champion more knowledge of autism, but fresh ideas for newsrooms. Photo from Fanhouse. McElwain is third from left. Since we’re on the subject of origins, AOL’s FanHouse returned to the spark that electrocuted stereotypical conventions of autism going back to Rain Man. 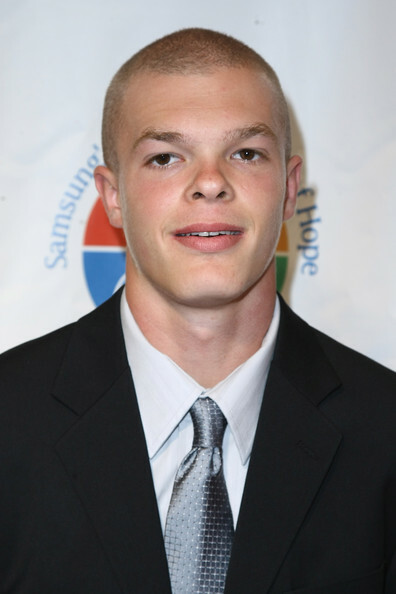 Jason McElwain, who scored 20 points in Greece-Athena High School’s final home game of the 2005-06 season after spending the year as a student manager (the now 6′ McElwain was considered too short to play with his 5’6″ frame in 2006), has lived a rather quiet life since that game transformed him from an average kid to inspiring celebrity. 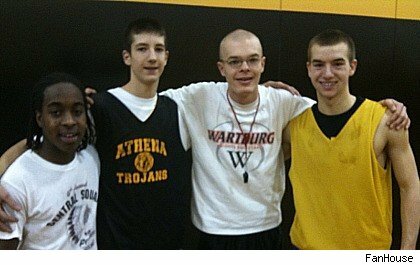 McElwain now spends his time as a volunteer assistant coach for Athena’s JV basketball team as he pursues his dream of coaching high school basketball. The article is a profile story to the T updating us on what McElwain is doing since his 20-point game four years ago. He holds a part-time job at Wegman’s, a grocery store chain, and was invited by Colts quarterback Peyton Manning to attend the team’s preseason training camp. McElwain has participated every year for the past four seasons, and McElwain returns the favor by drafting Manning and kicker Adam Vinatieri in McElwain’s fantasy league. Throughout the story, the writer includes anecdotes of McElwain’s behavior that will strike a chord in autism world (including his desire to get to practice while the writer glances over pictures of McElwain with celebrities and a binder from a Gatorade commercial shoot). I learned a lot reading this since the hoopla surrounding McElwain has long faded. The most notable segment was the reporter asking McElwain’s father if Jason would be any different had he never stepped on the court four years ago. His father doesn’t believe there would be much of a difference while Jason regrets a coaching decision he made during a JV team scrimmage. My post on autism and the job market highlighted the passion autistics often have for their interests, disregarding almost everything else to maintain their focus. McElwain is no exception, although it’s difficult to say how far his coaching career could go should his passion stay there. Based on the article, there are still traits that could interfere with his interactions, especially toward people unfamiliar with his story (good luck finding them in these parts). This won’t be a game-changer for autism and media coverage, but for you journalists in training, it’s not uncommon for reporters to follow-up on big stories. If the subject is controversial or inspirational enough, make a note, because chances are you’ll be assigned to check those stories after the initial wave. Profile stories give viewers the glimpse they often seek after hearing a story like McElwain’s, and this one communicates the message that Jason’s visible label fails to dissuade him from executing his game plan. We’re always labeled, but how we interpret them determines our fate more than labels do.